Billed as Heavy Jam, this is a blistering set from Roadburn 2012 featuring J Mascis, Mario Rubalcaba (Earthless), Mike Eginton (Earthless) & Graham Clise (Witch, Lecherous Gaze, Sweet Apple). You can watch fan recorded video of the set as well as another video clip where J joined Earthless onstage at SXSW 2009. I am pretty sure this is the only time I have seen footage J Mascis trashing some gear on stage! Blistering set!! The wait is finally over… the Earthless Meets Heavy Blanket record is available for pre-sale! The official street date is not until July 8th, but we have a special, limited edition pressing of just 300 copies on purple sky vinyl available for pre-order right now. 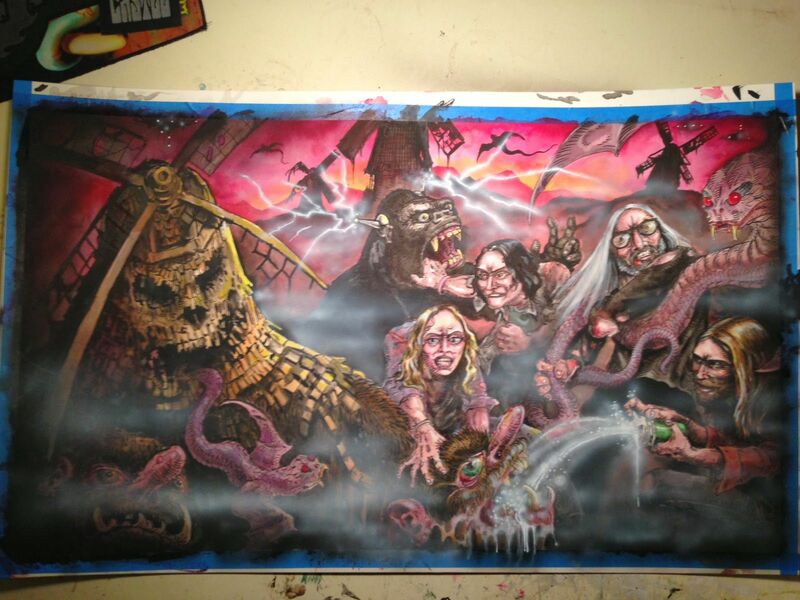 It is an incredible package… double LP, gatefold sleeve, with insane artwork from <a href=”http://timlehi.com/”>Tim Lehi</a>. On top of all that, we have super cool posters of the artwork which we will be giving away to everyone who buys the limited edition purple sky version. These will start shipping in early June, get your pre-order in now before they sell out! Titanic Team-Up Featuring Psych Rock’s Heaviest Hitters Takes Physical Form! Monstrous Mash-Up From Members of Dinosaur Jr., Lecherous Gaze, OFF!, Rocket From the Crypt, Sweet Apple, Witch and More Delivers Whiz-Bang Wallop the Likes of Which the World Has Never Heard Before!!! 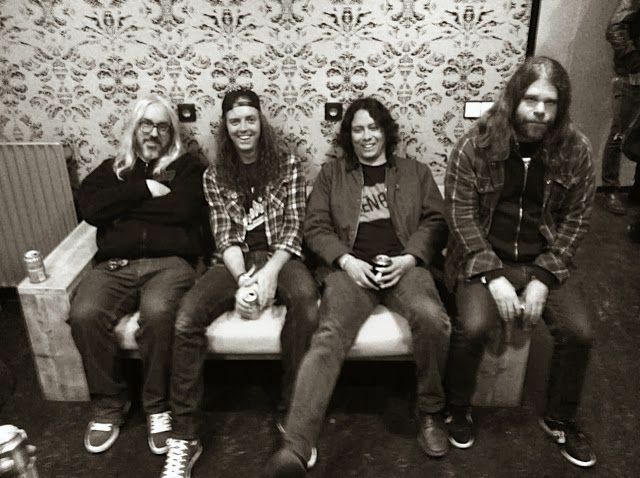 This July, a colossal collaborative concert, previously privy only to those who were fortunate enough to have helped fill a Netherlandic concert hall multiple moons ago, will be unleashed in awesome audio form as EARTHLESS Meets HEAVY BLANKET In A Dutch Haze. The out-of-this-world recording will see a July 8 release date via Outer Battery Records / Roadburn Records. Back-story: an impromptu heavy psych JAM between J Mascis (DINOSAUR JR, SWEET APPLE, WITCH and one of both Rolling Stone and SPIN‘s “Greatest Guitarists of All Time“) and California space rock masters EARTHLESS at the 2009 SXSW Festival left an onlooking crowd stunned and breathless. When word of the performance spread, the world-renowned musicians were asked to play the main stage of Holland’s annual international rock festival,Roadburn, to attempt to recreate the magic that revved-up an Austin audience at what was thought to be a one-time event. Fast forward to the 2012 installment of the fantastic fest; when EARTHLESS‘ guitarist Isaiah Mitchell had to back out at the last minute due to unforeseen circumstance, six-string shredder Graham Clise from J Mascis‘ loud, psychedelic project HEAVY BLANKET (and who also plays with Mascis in WITCH and in the bitchin’ Bay Area band LECHEROUS GAZE) stepped in on second guitar. Backed by the best rhythm section in today’s adventurous rock world – Mario Rubalcaba and Mike Eginton from EARTHLESS – the quartet stormed the stage for what would become an incredible one-time happening, leading to almost a full hour of some of the most mind-bending heavy psych imaginable. The epic jam session gave birth to shredding psychedelia and hard rock blues underpinned by the muscular rhythmic sensibilities of kraut-rock and the unbridled energy of 70′s guitar rock. The formidable foundation laid by drummer Rubalcaba became a jumping off point for Mascis, Clise and Eighton to explore their inner cosmoi for consciousness-expanding riffs and music-induced psychedelic experiences. Now, the rest of the planet can ready their receivers and hoist headphones on high as the full live set from that magical evening in Tilburg is set to be unleashed upon an unsuspecting world! Far-out, gatefold-spanning artwork by San Francisco tattoo artist and designer Tim Lehi (High on Fire, Black Anvil, Xasthur) perfectly animates this incredible audio adventure, while matchless mastering by Carl Saff (Boris, Guided By Voices), pushes this priceless performance over-the-top. Flame retardant clothing is highly recommended!